The Canada Pension Plan Investment Board (CPPIB) delivered a net investment return of 18.3% for fiscal 2015—the biggest one-year return since it was created. 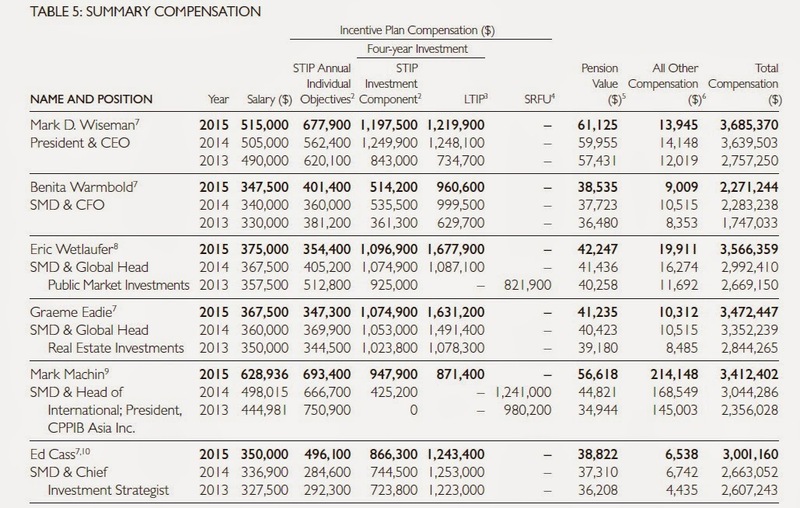 The CPP fund ended the year with net assets of $264.6 billion, compared to $219.1 billion at the end of fiscal 2014. The $45.5 billion increase in assets for the year consisted of $40.6 billion in net investment income after all CPPIB costs and $4.9 billion in net CPP contributions. Multiple factors contributed to fiscal 2015 growth, including all major public equity markets, bonds, private assets and real estate holdings. Combined, all three of CPPIB’s investment departments delivered substantial investment income to the Fund. International markets, both emerging and developed markets, advanced significantly, boosting returns further as CPPIB continues to diversify the fund. The benefit of the fund’s diversification across currencies also played a role in its returns, as the Canadian dollar fell against certain currencies, including the U.S. dollar. In the 10-year period up to and including fiscal 2015, CPPIB has contributed $129.5 billion in cumulative net investment income to the fund after all CPPIB costs, and more than $151.5 billion since inception in 1999, meaning that over 57% of the fund’s cumulative assets are the result of investment income. The Canada Pension Plan Investment Board sees the United States as a key destination for investments in the near term, but expects to shift a bigger share of its assets to faster-growing emerging economies over time. “We believe they will undoubtedly have ups and downs, but in the long run those economies will produce disproportionately higher growth than the developed economies of Europe and North America,” Wiseman said. The CPP Fund reported Thursday a return of 18.3 per cent for its latest financial year, its best showing ever. Compared with the end of fiscal 2014, the fund’s assets were up $45.5 billion from the end of fiscal 2014 — the biggest one-year gain since the fund received its first money for investments in March 1999. In the medium term, Wiseman said there are “excellent prospects” in the United States, which is home to about $100.7 billion or 38 per cent of the fund’s assets — the largest of any country. “We see more investment opportunities there than in other developed world markets,” Wiseman said. As for Canada, which represented about 24.1 per cent of the fund’s assets as of March 31, Wiseman said the CPPIB continues to have a positive view despite the impact of the recent oil price shock. He said lower energy prices, the decline in the loonie’s value against the U.S. dollar, and “solid growth” in the United States — Canada’s biggest market — should help the overall economy. “So, by and large, we remain optimistic about Canada as well as the U.S,” Wiseman said. The CPP Investment Board says there were multiple reasons for the strong investment performance last year, including growth at all major stock markets, bonds, private assets and real estate holdings. Only $4.9 billion of last year’s increase came from employer and employee contributions while $40.6 billion came from investments. None of the fund’s assets were required to pay benefits to current retirees, with contributions expected to carry the load until the end of 2022. The value of its investments also got a $7.8-billion boost in fiscal 2015 from a decline in the Canadian dollar against certain currencies, including the U.S. dollar and U.K. pound. The fund’s 10-year inflation-adjusted rate of return was 6.2 per cent — well above the 4.0 per cent that Canada’s chief actuary estimates is necessary. The CPP Fund ended its fiscal year on March 31, 2015, with net assets of $264.6 billion, compared to $219.1 billion at the end of fiscal 2014. The $45.5 billion increase in assets for the year consisted of $40.6 billion in net investment income after all CPPIB costs and $4.9 billion in net CPP contributions. The portfolio delivered a gross investment return of 18.7% for fiscal 2015, or 18.3% on a net basis. In the 10-year period up to and including fiscal 2015, CPPIB has contributed $129.5 billion in cumulative net investment income to the Fund after all CPPIB costs, and over $151.5 billion since inception in 1999, meaning that over 57% of the Fund’s cumulative assets are the result of investment income. Multiple factors contributed to fiscal 2015 growth, including all major public equity markets, bonds, private assets and real estate holdings. Combined, all three of CPPIB’s investment departments delivered substantial investment income to the Fund. International markets, both emerging and developed markets, advanced significantly, boosting returns further as CPPIB continues to diversify the Fund. The benefit of the Fund’s diversification across currencies also played a role in its returns, as the Canadian dollar fell against certain currencies, including the U.S. dollar. The Canada Pension Plan’s multi-generational funding and liabilities give rise to an exceptionally long investment horizon. To meet long-term investment objectives, CPPIB is building a portfolio and investing in assets designed to generate and maximize long-term returns. Long-term investment returns are a more appropriate measure of CPPIB’s performance than returns in any given quarter or single fiscal year. In the most recent triennial review released in December 2013, the Chief Actuary of Canada reaffirmed that, as at December 31, 2012, the CPP remains sustainable at the current contribution rate of 9.9% throughout the 75-year period of his report. The Chief Actuary’s projections are based on the assumption that the Fund will attain a prospective 4.0% real rate of return, which takes into account the impact of inflation. CPPIB’s 10-year annualized nominal rate of return of 8.0%, or 6.2% on a real rate of return basis, was comfortably above the Chief Actuary’s assumption over this same period. These figures are reported net of all CPPIB costs to be consistent with the Chief Actuary’s approach. The Chief Actuary’s report also indicates that CPP contributions are expected to exceed annual benefits paid until the end of 2022, after which a portion of the investment income from CPPIB will be needed to help pay pensions. CPPIB measures its performance against a market-based benchmark, the Reference Portfolio, representing a passive portfolio of public market investments that can reasonably be expected to generate the long-term returns needed to help sustain the CPP at the current contribution rate. In fiscal 2015, the CPP Fund’s gross return of 18.7% outperformed the Reference Portfolio delivering $3.6 billion in gross dollar value-added (DVA) above the Reference Portfolio’s return, after external management fees and transaction costs. Net of all CPPIB costs, the investment portfolio exceeded the benchmark’s return by 1.3%, producing $2.8 billion in net DVA. Given our long-term view and risk-return accountability framework, we track cumulative value-added returns since the April 1, 2006, inception of the Reference Portfolio. Cumulative value-added over the past nine years totals $5.8 billion, after all costs. CPPIB total costs for fiscal 2015 consisted of $803 million or 33.9 basis points of operating expenses, $1,254 million of external management fees and $273 million of transaction costs. CPPIB reports on these distinct cost categories as each is materially different in purpose, substance and variability. We report the external management fees and transaction costs we incur by asset class and report the investment income our programs generate net of these fees. 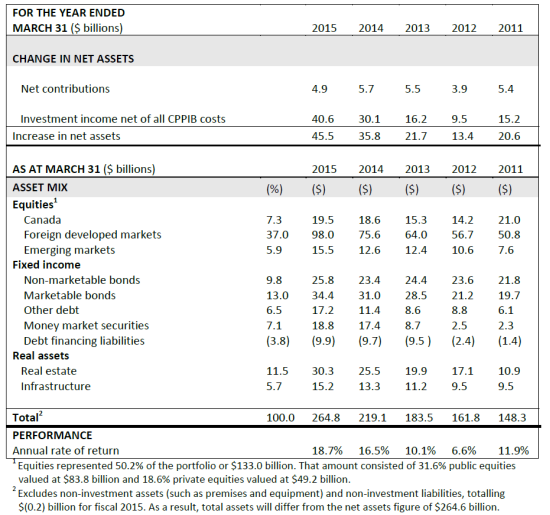 We then report on total Fund performance net of CPPIB’s overall operating expenses. Fiscal 2015 CPPIB operating expenses reflect increased incentive compensation due to strong total Fund and DVA performance over the past four years, and the continued expansion of CPPIB’s operations and further development of our capabilities to support 17 distinct investment programs. International operations accounted for approximately 30% of operating expenses, including the impact of a weaker Canadian dollar relative to countries we have operations in. Fiscal 2015 external management fees and transaction costs reflect the continued growth in the volume and sophistication of our investing activities. With external management fees also reflecting performance-based fees, the year-over-year increase was in part driven by higher performance fees for exceptional financial performance. The increase in transaction costs in fiscal 2015 was due to a large private market transaction. Portfolio performance by asset class is included in the table below. 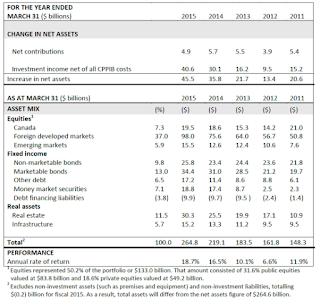 A more detailed breakdown of performance by investment department is included in the CPPIB Annual Report for fiscal 2015, which is available at www.cppib.com. We continued to diversify the portfolio by return-risk characteristics of various assets and geographies during fiscal 2015. 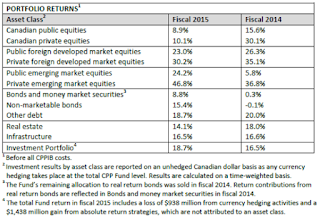 Canadian assets represented 24.1% of the portfolio, and totalled $63.8 billion. International assets represented 75.9% of the portfolio, and totalled $201.0 billion. Signed an agreement to invest approximately £1.6 billion to acquire a 33% stake in Associated British Ports (ABP) with Hermes Infrastructure, an existing U.K.-based partner. ABP is the U.K.'s leading ports group, owning and operating 21 ports with a diverse cargo base, long-term contracts with a broad mix of blue chip customers and experienced management. Expanded our Australian infrastructure portfolio with a A$525 million commitment to build and operate a new tunnelled motorway in Sydney, called NorthConnex. This transaction was completed with Transurban Group and Queensland Investment Corporation, our existing partners in the Westlink M7 toll road. CPPIB will own a 25% stake in the nine-kilometre motorway that will connect Sydney’s northern suburbs with the orbital road network and will be the longest road tunnel project in Australia. Completed our first investment in India's infrastructure sector with the country’s largest engineering and construction company. We committed US$332 million in the Larsen & Toubro Limited (L&T) subsidiary, L&T Infrastructure Development Projects Limited (L&T IDPL), which has a portfolio of 20 infrastructure assets, including India’s largest private toll road concession portfolio spanning over 2,000 kilometres. Completed a US$596 million secondary private equity investment in two JW Childs funds. As the lead investor, CPPIB invested US$477 million in a secondary transaction related to the JW Childs Equity Partners III fund, which provided an attractive liquidity solution to existing limited partners. We also committed US$119 million to a new fund, JW Childs Equity Partners IV. JW Childs focuses primarily on mid-market investments in the consumer products, specialty retail and healthcare services sectors across North America. Acquired 172,382,000 ordinary shares of Hong Kong Broadband Network Limited (HKBN) as the sole cornerstone investor in HKBN’s initial public offering. CPPIB invested HK$1,551 million for an approximate 17% ownership interest, becoming the largest shareholder. HKBN is Hong Kong’s second largest residential broadband service provider by number of subscriptions, reaching more than 2.1 million residential homes and 1,900 commercial buildings. Received an additional Qualified Foreign Institutional Investor (QFII) quota of US$600 million to invest in China A-shares that are traded on the Shanghai and Shenzhen Stock Exchanges. Since 2011, when CPPIB obtained its QFII licence, a total allocation of US$1.2 billion has been granted to CPPIB, thereby making it among the top 10 largest QFII holders. Invested US$250 million in the initial public offering of Markit Ltd., representing an approximate 6% ownership interest. Founded in 2003, Markit is a globally diversified provider of financial information services that enhance transparency, reduce risk and improve operational efficiency. Entered into a new real estate sector with the 100% acquisition of a U.K. student accommodation portfolio and management platform operating under the Liberty Living brand, at an enterprise value of £1.1 billion. Liberty Living is one of the U.K.’s largest student accommodation providers with more than 40 high-quality residences located in 17 of the largest university towns and cities across the U.K. Committed RMB 1,250 million to jointly develop the Times Paradise Walk project, a major mixed-use development in Suzhou, the fifth most affluent city in China, with Longfor Properties Company Ltd. The mixed-use development comprises residential, office, retail and hotel space for a total gross floor area of 7.9 million square feet. It is designed to be a top-quality, one-stop commercial destination in Suzhou with completion scheduled in multiple phases between 2016 and 2019. Significantly expanded CPPIB’s real estate portfolio in Brazil during the year. We committed approximately R$1.3 billion to Brazilian retail, logistics and residential assets this year, bringing our total equity commitment to date to R$5.5 billion. This included a R$507 million commitment for a 30% ownership stake in a new joint venture with Global Logistic Properties comprising a high-quality portfolio of logistics properties located primarily in São Paulo and Rio de Janeiro. Invested approximately €236 million in Citycon Oyj to hold 15% of the shares and voting rights, expanding CPPIB’s retail platform in the Nordic region. Citycon is a leading owner and developer of grocery-anchored shopping centres in the region. The investment helped to support Citycon’s acquisition and development opportunities. Entered into a joint venture partnership with GIC to acquire the D-Cube Retail Mall in Seoul, South Korea from Daesung Industries for a total consideration of US$263 million. Following the transaction, GIC and CPPIB will each own a 50% stake in the mall. Completed in 2011, D-Cube is an income-generating, high-quality retail mall in a prime location. Entered into an agreement to form a strategic joint venture with Unibail-Rodamco, the second largest retail REIT in the world and the largest in Europe, to grow CPPIB's German retail real estate platform. The joint venture will be formed through CPPIB's indirect acquisition of a 46.1% interest in Unibail-Rodamco's German retail platform, mfi management fur immobilien AG (mfi), for €394 million. In addition, CPPIB will invest a further €366 million in support of mfi's financing strategies. Signed an agreement to acquire an approximate 12% stake, by investing £1.1 billion alongside Hutchison Whampoa, in the telecommunications entity that will be created by merging O2 U.K. and Three U.K. Signed a definitive agreement to acquire Informatica Corporation for US$5.3 billion, or US$48.75 in cash per common share, alongside our partner, the Permira funds. Informatica is the world’s number one independent provider of enterprise data integration software. The transaction is expected to be completed in the second or third quarter of calendar 2015. Invested US$335 million in the senior secured notes of Global Cash Access, Inc. (GCA) through our Principal Credit Investments group. GCA is the leading provider of cash access solutions and related gaming and lottery products to the gaming sector. Signed an agreement, together with BC European Capital IX (BCEC IX), a fund advised by BC Partners, management and other co-investors, to sell a 70% stake in Cequel Communications Holdings, LLC (together with its subsidiaries, Suddenlink) to Altice S.A. Upon closing of the proposed sale, it is expected that BCEC IX and CPPIB will each receive proceeds of approximately US$960 million and a vendor note of approximately US$200 million. CPPIB and BCEC IX will each retain a 12% stake in the company. Announced that AWAS, a leading Dublin-based aircraft lessor, signed an agreement to sell a portfolio of 90 aircraft to Macquarie Group Limited for a total consideration of US$4 billion. CPPIB owns a 25% stake in AWAS alongside Terra Firma, which owns the remaining 75% stake. Sold our 50% interest in 151 Yonge Street to GWL Realty Advisors. Proceeds from the sale to CPPIB were approximately $76 million. Located in downtown Toronto, 151 Yonge Street was acquired in 2005 as part of a larger Canadian office portfolio acquisition. Sold our 39.4% interest in a Denver office properties joint venture to Ivanhoé Cambridge. Proceeds from the sale to CPPIB were approximately US$132 million. In May 2015, we continued to expand our global presence with the official opening of a CPPIB office in Luxembourg, representing our sixth international office. We have a significant and growing asset base in Europe today. Establishing an office in Luxembourg supports our global strategy of building out our internal capabilities to support our long-term investment goals. Through our Luxembourg office, we will conduct asset management activities such as investment monitoring, cash management, finance and operations, including transaction support, legal and regulatory compliance.‎ Looking ahead, we expect to complete our previously announced plans to open an office in Mumbai later in calendar 2015. Welcomed the appointment of Dr. Heather Munroe-Blum as the new Chair of CPPIB’s Board of Directors. Dr. Munroe-Blum succeeded Robert Astley, CPPIB’s Chair since 2008, upon the expiry of his term on October 26, 2014. Welcomed the appointment of Tahira Hassan to CPPIB’s Board of Directors in February 2015 for a three-year term. Ms. Hassan also serves as a non-executive Director on the Boards of Brambles Limited and Recall Holdings Limited and held various executive leadership roles with Nestlé for more than 26 years. Mark Jenkins was promoted to Senior Managing Director & Global Head of Private Investments responsible for leading the direct private equity, infrastructure, principal credit investments, natural resources and portfolio value creation functions. Mr. Jenkins joined CPPIB in 2008 and most recently held the role of Managing Director, Head of Principal Investments. Pierre Lavallée was appointed to the new role of Senior Managing Director & Global Head of Investment Partnerships. Mr. Lavallée, who joined CPPIB in 2012, leads this new investment department to focus on broadening relationships with CPPIB’s external managers in private and public market funds, secondaries and co-investments, expanding direct private equity investments in Asia and further building thematic investing capabilities. Following the year end, Patrice Walch-Watson was appointed to Senior Managing Director & General Counsel and Corporate Secretary, and a member of the Senior Management Team, effective June 5, 2015. Ms. Walch-Watson joins CPPIB from Torys LLP where she was a Partner, with expertise in mergers and acquisitions, corporate finance, privatization and corporate governance. You can download CPPIB's Annual Report for fiscal 2015 by clicking here. Take the time to read it, it's well written and provides in-depth information on their investments and a lot more. At the very least, read the President's message here. 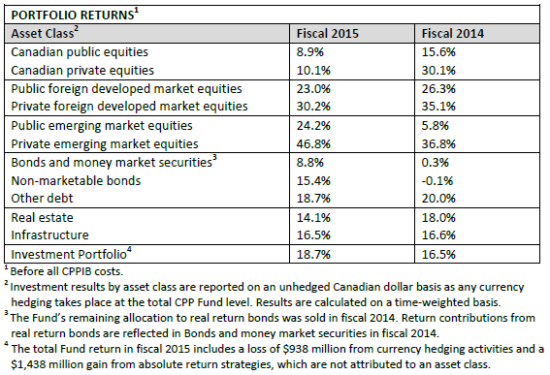 Fiscal 2015 was an exceptional year for CPPIB. All public and private investments delivered strong gains. Most were double digit gains except for Canadian equities and bonds which each delivered a 9% gain. Also, the value of its investments got a $7.8-billion boost in fiscal 2015 from a decline in the Canadian dollar against certain currencies like the U.S. dollar and U.K. pound. That really sums it all up. Yes, it's expensive to run an operation like CPPIB but the cumulative value-added over the past nine years totals $5.8 billion, after all costs. And they have done a good job of keeping those costs down, investing directly where they can. And then people wonder why I'm such a stickler for enhancing the CPP for all Canadians. Because bar none, this is the most cost effective way to bolster the retirement security of all Canadians. The results speak for themselves and the fact is CPPIB invests across public and private markets, which adds important long-term diversification benefits. But keep in mind this is an almost $300 billion fund operating in Toronto, which is is why they need to be competitive with compensation. Still, I wouldn't call Mark Wiseman's compensation outrageous relative to some of his peers. I think he gets paid very well for what he does and the huge responsibilities he has. Not exactly the epitome of diversification and Canadian multiculturalism, eh? Having said this, I trust Mark Wiseman and his senior managers are doing an outstanding job managing this juggernaut. One thing I won't hide from you is that I've applied to jobs at CPPIB and even got an email from Mark nicely explaining "why I don't fit" in their organization and that they tried to find me " a suitable position." This is all rubbish to me because when David Denison was in charge of the place, I went as far as an interview for a job before the folks at PSP cut me off with one phone call (I know a lot more than people give me credit for which is why I find these excuses downright insulting). Also, I know far too many talented folks who haven't been hired at CPPIB and all of them have received lame, if not laughable excuses. The same with other large Canadian pensions. Something is seriously wrong in the HR departments at CPPIB, the Caisse, PSP, Ontario Teachers and elsewhere if they're not hiring these talented individuals (and I include myself in that group). And I have no qualms stating this publicly. Getting hired at these places is all about politics. I also noticed they don't like hiring people who are smarter than them or who can challenge them in any way, shape or form. Too bad, this is why the culture at these places reeks of politics, and why I just don't buy that "the best and brightest" are working at these places (again, I'm entitled to my opinion and the folks working at these places are entitled to theirs but I can give you my A-list of amazing individuals that were not hired for flimsy reasons at any of these coveted organizations). I'm starting to get cynical in my old age. I'll end on a positive note, however. These results are only one year but the long-term results, the ones that count, are equally impressive. CPPIB is doing something right to manage the hundred of billions they're responsible for. And again, in spite of my criticism, I still maintain that we need to enhance the CPP for all Canadians. Period. Take the time to read all the recent articles on CPPIB here. They have been very busy lately on all sorts of deals, some with partners and some with their peers like the Caisse. Below, listen to CPPIB employees talk about what makes the organization a special place to work. Take these comments with a grain of salt. And again, where are the visible minorities? People with disabilities? This is the biggest Crown corporation in Canada and we need to be on their case to diversify their workforce at all levels because it doesn't represent Canadian multiculturalism at its best. If that last comment pisses off some people at CPPIB, tough luck, that is my opinion. Let them publish something in their Annual Report providing hard statistics to counter my claims. 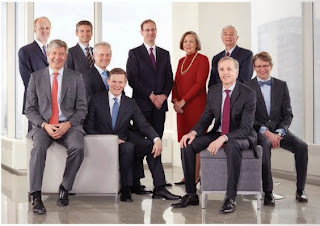 And when it comes to governance, CPPIB and all of Canada's top ten gloat on how they're the best but they can't even get diversity in the workplace right.